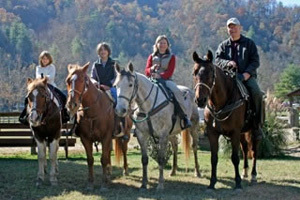 Horseback Riding Birthday Parties incorporate horse rides into your child’s party! The horses are led by a wrangler of Leatherwood Mountains. In this kind of party the guests don’t have to actually control the horses. It is well suited for very large groups of children or groups of very young children who are not coordinated enough to guide the horses themselves. The cost for this type of party is $80 per horse per hour. The minimum charge is for one hour. The number of horses used depends on the number of guests and how long each guest wants to ride. All riders wear protective helmets while riding. We can accommodate as many children during these sessions as time will permit. Rent our shaded picnic shelter for $35 per hour to serve your birthday cake & open presents. We have cool weather options too.